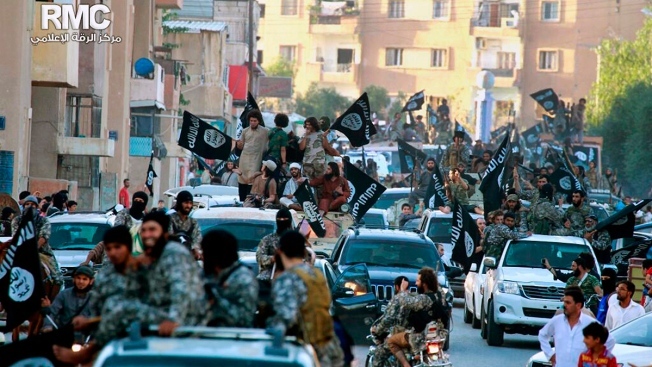 In this undated file image posted on Monday, June 30, 2014, by the Raqqa Media Center of the Islamic State group, which has been verified and is consistent with other AP reporting, fighters from the Islamic State group parade in Raqqa, north Syria. After being nearly defeated on the battlefields of its would-be caliphate, the Islamic State of Iraq and Syria group has reverted to what it was before its spectacular conquests in 2014, analysts say — a shadowy insurgent network that targets civilian populations with guerrilla-style attacks and exploits state weaknesses to incite sectarian strife. In Iraq and Syria, hardly a week goes by without the group staging an attack on a town or village, keeping its opponents on edge even as it fights U.S.-backed forces advancing on the last remaining slice of territory under its control near the countries' shared border. Hisham al-Hashimi, an ISIS expert who advises the Iraqi government, said the group now operates like it did in 2010, before its rise in Iraq, which culminated four years later with the militants seizing one of Iraq's biggest cities, Mosul, claiming the city of Raqqa in Syria and declaring an Islamic caliphate across large areas of both countries. Al-Hashimi said the world's most dangerous insurgent group is trying to prove that despite losing its territorial hold, "it still has long arms to strike." While it fends off attacks on its remaining pockets in Syria, a recent surge in false claims of responsibility for attacks also signals that the group is struggling to stay relevant after losing its proto-state and its dominance on the international news agenda. The main figures behind the group's once sleek propaganda machine have mostly been killed. Raqqa fell a year ago this month, and the group has lost all but 2 percent of the territory it held in Iraq and Syria. There are concerns, however, that while ISIS may never be able to recreate the kind of territorial hold it once had, it is trying to latch on to new territory. One of the group's deadliest attacks since the collapse of the supposed caliphate came in late July, when dozens of masked ISIS fighters stormed the southern city of Sweida and nearby villages inhabited by members of Syria's Druze minority, gunning down more than 200 people and kidnapping about 30, mostly women and children. The ambush shook the community, which had stayed on the sidelines of Syria's seven-year civil war and took many by surprise, raising fears that as the militants are on the retreat, they will try to regroup in remote pockets of territory like this once quiet corner of the country. Last month, ISIS fighters stormed the northern Iraqi village of Gharib, killing three villagers and wounding nine after residents refused to collaborate with them and give them supplies such as food and ammunition. Last week, ISIS attacked the village of Saadiyeh, south of the northern Iraqi city of Mosul, killing three and abducting one. 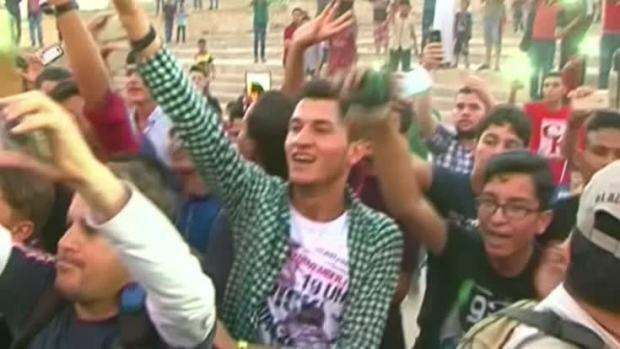 Iraqi Prime Minister Haider Al-Abadi is greeted by cheering residents after arriving in Mosul, where Iraqi forces are fighting to retake the last bit of the battle-ruined city from ISIS fighters. Iraqi military spokesman Big. Gen. Yahya Rasoul said this week that security forces have begun a broad operation in the western province of Anbar that borders Syria to take out ISIS sleeper cells. Analysts warn that this could be the beginning of a new resurgence of the group similar to the one that preceded their rise in 2010, after many thought the group's predecessor, the Islamic State in Iraq, had been defeated during the U.S. surge there in 2007. Hassan Hassan, senior research fellow at George Washington University's Program on Extremism, wrote in a recent article that ISIS has been able to undergo an orderly transition from caliphate to insurgency without fracturing. Last month, U.S.-backed Syrian fighters of the Syrian Democratic Forces began a final push to retake Hajin, the last pocket held by ISIS on the eastern banks of the Euphrates River near the Iraq border. They have had to advance slowly as the extremists rely on mines, snipers fire and suicide attacks in defending their positions. Clashes this week in the Syrian village of Sousah left more than two dozen fighters on both sides dead as ISIS fighters took advantage of a sandstorm and bad visibility to attack SDF positions. It's not clear how many militants are still fighting with ISIS. A United Nations report released in August said ISIS has up to 30,000 members distributed roughly equally between Syria and Iraq, and said its global network increasingly poses a threat. The U.N. report said that despite the defeat of ISIS in Iraq and most of Syria, it is likely that a reduced "covert version" of the militant group's "core" will survive in both countries, with significant affiliated supporters in Afghanistan, Libya, Southeast Asia and West Africa. "Make no mistake about it, as [ISIS] has collapsed inward, in their own way, they have reinforced a center as they've been forced into what is now less than 2 percent of their original territory," U.S. Defense Secretary Jim Mattis said in Paris earlier this month. Many are concerned that while the United States, working with local allies, was able to destroy the physical caliphate relatively quickly, it did not fix governing problems that originally created the opportunity for ISIS to emerge, including frustrations among the Sunni populations of both countries. "ISIS is waging an effective campaign to re-establish durable support zones while raising funds and rebuilding command-and-control over its remnant forces," said a recent report by the Institute for the Study of War. "ISIS could regain sufficient strength to mount a renewed insurgency that once again threatens to overmatch local security forces in both Iraq and Syria." In August, following months of conflicting reports on whether he was alive, ISIS released a new audio message, purportedly of its shadowy leader Abu Bakr al-Baghdadi, the first such recording to emerge in almost a year. The speaker urged followers to "persevere" and continue fighting the group's enemies. He also urged supporters in the West to carry out more attacks, adding that each "operation in your land equals a thousand" in the Middle East. In August, shortly after news broke out of a man killing two people in France, ISIS claimed responsibility for the attack. It later became clear that the man was mentally disturbed and had family disputes. Last month, ISIS claimed responsibility an attack in Iran's Ahvaz region, but initially made factually incorrect claims about it. Later, ISIS released footage of several men that Iran ultimately identified as attackers, though the men in the footage are not known to have pledged allegiance to the extremist group. Associated Press writers Maamoun Youssef and Sinan Salaheddin contributed to this report.